I spent a few hours in Prospect Park again this morning, mostly to try out the new Canon 400/f5.6L lens I’ve rented. The lens performed reasonably well, though the lack of image stabilization was a more serious impediment than I expected. I did get some nice shots, and 400 mm was really only too long for a few close gulls that were responding to chumming. Once again, the Park was extremely quiet aside from a few hotspots that featured relatively abundant food. The Vale of Cashmere had tufted titmouse, black capped Chickadee, Downy Woodpecker, Northern Cardinal, Morning Dove, Blue Jay, White-throated Sparrow, but nothing unusual. The feeders on Breeze Hill supported Red-winged Blackbird, White-breasted Nuthatch, Downy Woodpecker, American Goldfinch, Black-capped Chickadee, and one Red-breasted Nuthatch. This is the only even remotely unusual bird I found. There haven’t been a lot of them in the park this season, and if there’s a good seed crop up north next winter, there might not be any. They’re an irruptive species. Some years they’re everywhere. Some years you have to struggle to find one or two in the county. The final spot that was worth checking out was the south end of the lake. Lots of gulls here, mostly Ring-billed but also at least one Herring Gull and a couple of Great Black-backed Gulls. One American Crow flew onto the ice. Most of the Northern Shovelers and Ruddy Ducks that sometimes number in the hundreds here seem to have decamped for less frozen climes but there were still a few of each, along with a couple of American Coots, six or so Mute Swans, a lone male Bufflehead, and many, many Canada Geese and Mallards. The feral Muscovy (possibly Mallard hybrid) is still hanging out too. One Red-tailed Hawk flew to the top of a tree on West Island. This entry was posted on Saturday, January 9th, 2010 at 7:10 PM and is filed under Birding. You can follow any responses to this entry through the Atom feed. You can skip to the end and make a comment. Pinging is currently not allowed. Supersharp! Is it a keeper? 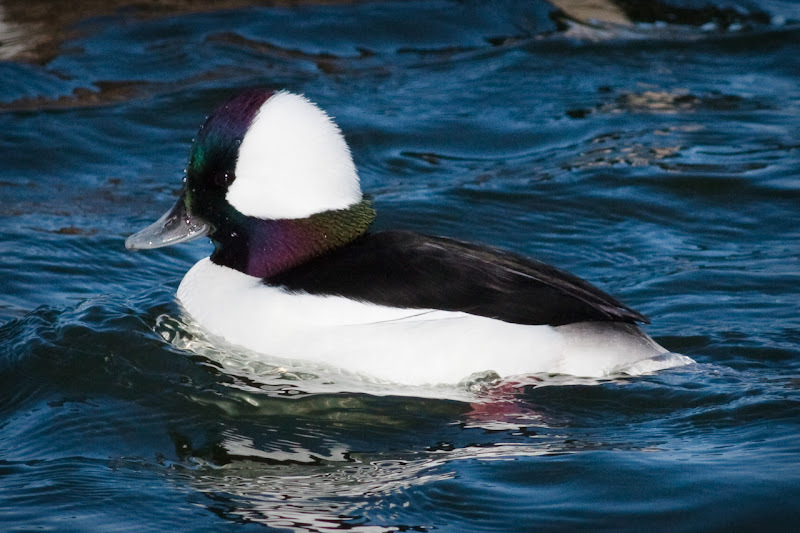 The Bufflehead I’m quite happy with. It was really close to shore (much closer than they usually are) and the light on the lake was good. 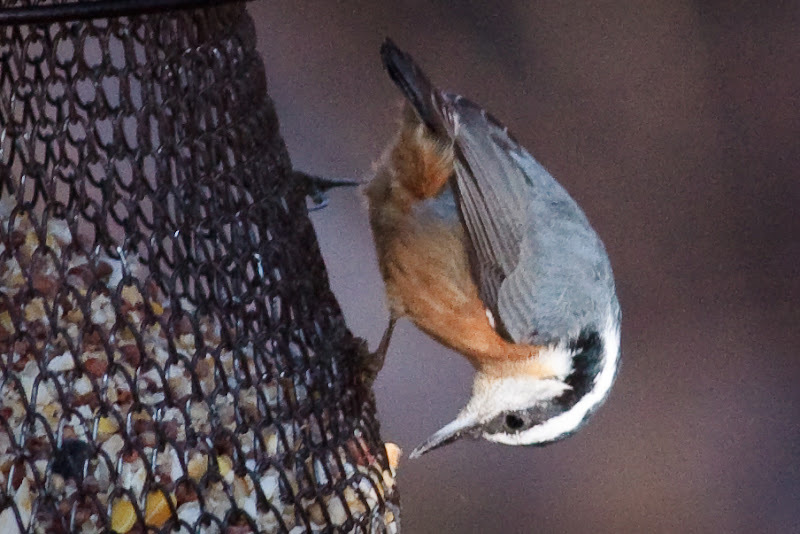 The Nuthatch is not especially good. That’s just the best photo I happened to get of that bird so I used it. 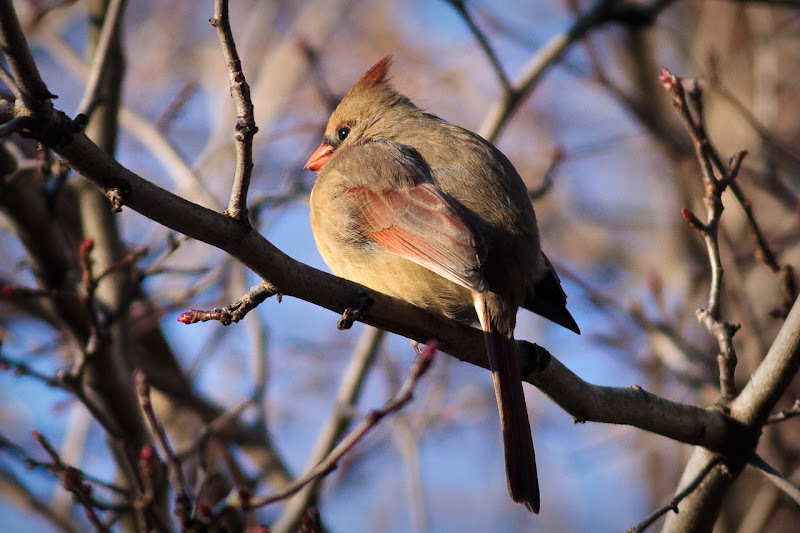 The cardinal is, if anything, too sharp. I oversharpened it in Lightroom. I have to remember that the process of reducing the size and converting to JPEG will sharpen the photo somewhat too, so I should ease back on the sharpening I apply to the raw file just a tad. The issue with this lens was not sharpness but focus, movement, and lighting. When I could get the bird into focus and keep the camera stable enough for the shutter speed, the sharpening took care of itself. Grain was a bit of a problem. I suspect that’s more an issue with the sensor than the lens. All of this should be improved in the brighter light of summer. Early morning winter light in the trees can be tough on pictures.